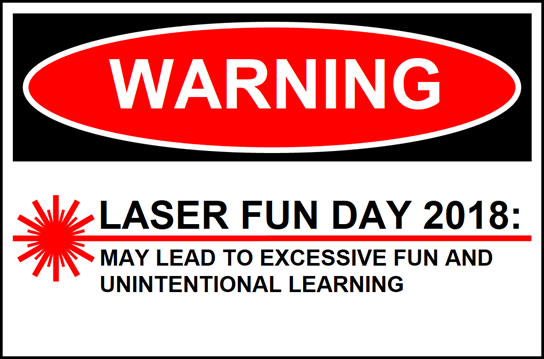 Our 8th Laser Fun Day is coming soon! Laser Fun Day 2018 is on April 7th, from 10AM to 3PM, and we need volunteers (You!) for this massive event. All volunteers will receive a Laser Fun Day shirt, pizza, and Eegees. 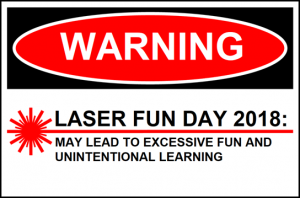 Our first Laser Fun Day Committee meeting is Friday, February 2nd at noon. FREE pizza will be provided. Bring your ideas for optical demonstrations, and we can work on making them come to life; this isn’t a low budget event, as we are supported by our generous event sponsors. Come join us inspire kids about STEM and optics!